These products are mainly used as the components of laser generation part (heat sink) of DVD player and Blu-ray disc player. Our products constitute about a 60% share of the international market. 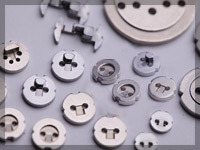 The high-precision processing with outer diameter precision 5 micron is possible. We also specialize in the integration of moldings with various shapes. 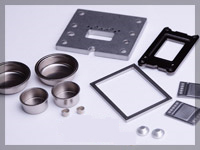 These components are used in all kinds of sensors to be fitted in the automobiles. Since it involves a human life, stringent quality standards need to be met; however, we provide components with high quality and reliability to domestic and overseas car manufacturers using our quality control knowhow cultivated over the years. 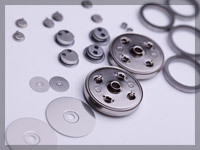 These are components used in automobiles and household electrical appliances to control time. 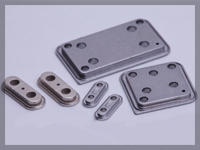 International competition is very intense in this field; however, we have achieved a perfect combination of low cost and high quality, well received especially by manufacturers stressing high quality, and delivered a number of these components. These are components necessary for fixing the crystal oscillator used in the personal computers, smart phones, etc. It is manufactured using our own Fine Blanking Processing Technology, and shear droop, burr, and rupture can be controlled at minimum. 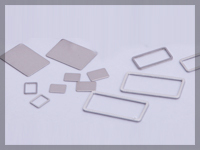 In addition, we manufacture components in the various fields such as universal sensors, precision electronic related components, etc.